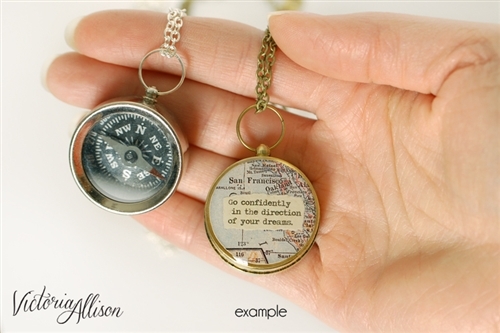 This small working compass necklace features an antique map print of the city of your choice, with an overlay of your own personalized quote (on tea stained paper!) Indicate your city choice in the "Map City Location" field. Please note that these maps are printed from my own antique atlas collection. The atlases are nearly 100 years old and sadly do not include *all* cities, so some small towns are not available. Not sure? Send me an email first and I'll be happy to check for you! All major cities are available. Unfortunately I cannot offer street addresses or landmarks. 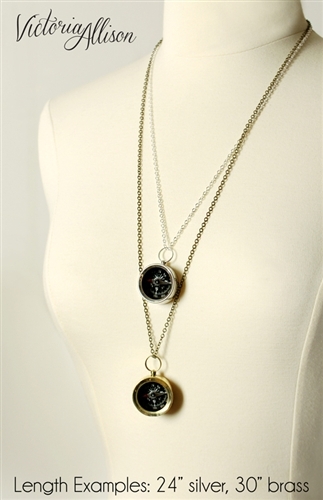 The vintage styled compass measures 1 1/8-inches wide/across (2.8cm) and is a little under 1/2-inch thick (1.3cm). The map and quote design is on the *back* of the compass, and is sealed with an acrylic jeweler's resin for a glossy finish. 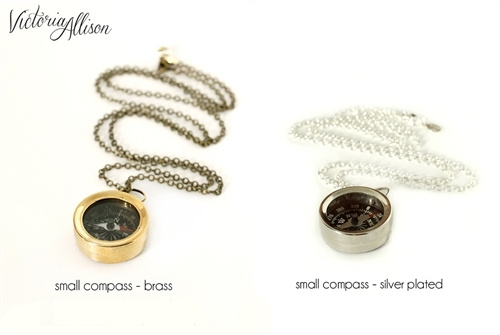 To protect the inner components of the compass, please keep it dry - do not swim or bathe with your compass. You may choose a special quote, phrase, birth date, initials, coordinates, anything you can dream up, and I will print it onto paper which I have hand tea-stained. 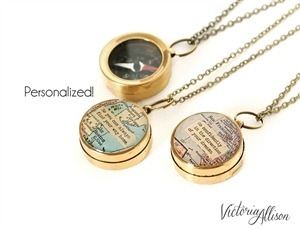 Write in your quote/text/etc in the Compass Quote Text box for me, and I will make it accordingly. Your featured city will be shown either above or below the quote section, depending on the map.